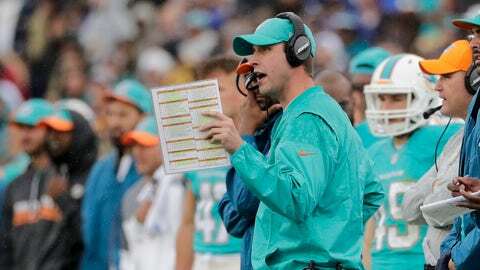 Adam Gase enters his second season as head coach of the Miami Dolphins. DAVIE, Fla. (AP) — Miami Dolphins coach and play caller Adam Gase concedes it can be impossible to ignore second-guessing fans, especially the one to whom he’s married. Gase says his wife, Jennifer, sometimes questions his decisions, such as a particular third-and-1 pass he ordered as offensive coordinator of the Denver Broncos. Few jobs invite more Monday morning quarterbacking than Sunday play calling, but Gase loves it anyway. He’s widely regarded as a rising star after leading the Dolphins to a playoff berth last year in his first season as a head coach, and is excited about the potential of this year’s offense led by newcomer Jay Cutler. But Cutler had the best year of his career with Gase calling plays. Ditto Tannehill last season. Peyton Manning threw an NFL-record 55 touchdown passes in Gase’s first year as an offensive coordinator with Denver. Gase is willing to admit mistakes, most recently saying a sack in Miami’s final exhibition game was his fault because he put the offense in a bad situation.